I’d been craving for Filipino food lately; the one that my mother used to cook! Even though almost all of those culinary memories are associated with meat and fish, I still can’t help but to long for my mother’s cooking. I’m certain it’s not the taste I’m hankering for, but it’s the amount of love and care my mother put into preparing and cooking the food. One of my personal favorite, is the one w/ black beans savory sauce with bokchoy! I love the pungent smell of black bean sauce! I know it sounds weird, but for me, the aroma of it brings back happy childhood memories. 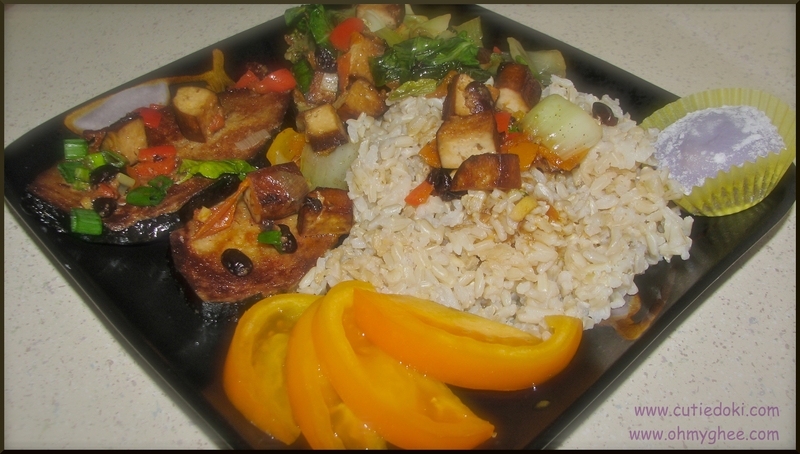 So, to satisfy my cravings, I made some veggie 2na with black bean sauce, bokchoy, and added some seasoned tofu. I also added my own masala concoction into this one, hahaha! If you notice in this recipe, a lot of tomatoes are needed. Since the black beans sauce is so salty, the tomatoes helps to mellow it down. 1. Pan fry the veggie 2na until golden brown. Set aside. 2. Cut the seasoned tofu into small cubes and pan fry. Set aside. 3. Cut the bokchoy and separate the leaves from the steam. Cut the steam into medium size cubes. 4. In a hot pan, pour in the peanut oil. When oil is hot, put the ginger and cooked it until slightly brown. Add in the masala and stir it with the ginger. 5. Mix in the tomatoes, bell peppers, and seasoned tofu and add the 2 cups of water. Simmer for 2 minutes. 6. Add the black beans sauce, sugar, bokchoy steams, and broccoli. Stir and simmer again for 2 minutes. 7. Add the bokchoy leaves and sesame oil, and do a quick stir. 8. Lastly, put the veggie 2na and simmer it for a second. Garnish it with some chives.